The Westminster Kennel Club and the New York Academy of Art have selected the winning artwork to represent the 137th annual Westminster Kennel Club Dog Show. A collection of oil-on-porcelain miniature portrait paintings by Robert Clark and Richard Moss won the art contest, sponsored for the third consecutive year by the New York Academy of Art. The Committee also named four finalists. 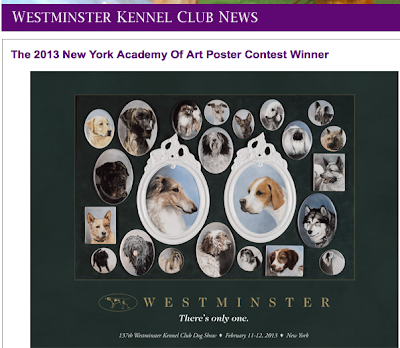 This image, which includes Malachy, the Pekingese that captured the 2012 Best In Show title, and Sensation, Westminster's mascot and logo model Pointer, as well as a number of other breeds, will be utilized in a poster and in other club materials to promote the 2013 show. Robert Clark is a graduate of the New York Academy of Art with a Masters in painting (MFA 1992). Richard Moss studied mosaic in Italy. For over twenty years, Clark and Moss have been working collaboratively to create both functional and decorative figurative art: easel-work and surfaces in stone, glass and ceramic. Together they have been recognized by the National Endowment for the Arts, the White House Millennium Project, museums and prestigious private collectors. Their published work includes luxury residences and notable hotels and restaurants. For a decade they have been reviving kiln-fired oil-on-porcelain in the style of 18th and 19th century Sevres and KoniglichePorzellanManufaktur (KPM). The artists' studio is at their farm in Ocala, FL, where they breed horses from the Royal Dutch Stud Book of the Netherlands and German riding ponies. Proceeds from sales of the poster will go to benefit the Project HEAL program offered by Educated Canines Assisting with Disabilities (ECAD). 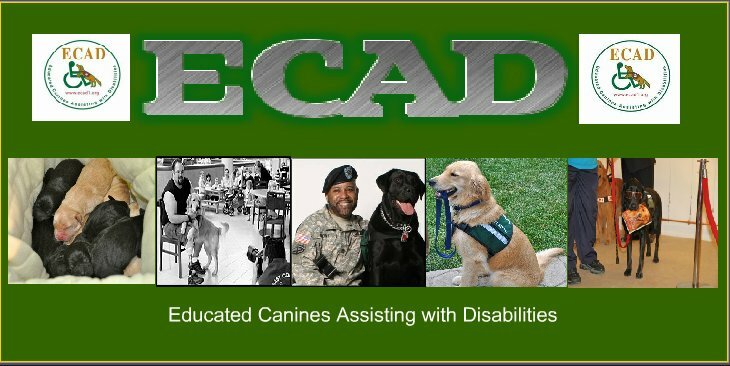 The mission of ECAD, a 501(c)(3) charity based in Dobbs Ferry, NY, is to train and place Assistance Dogs to help people with disabilities gain independence and mobility. Project HEAL honors and empowers Wounded Warriors by providing specially trained Service Dogs to increase independence and make a difference in their lives. Hey there! I am aware of this can be to some extent off-topic however was required to inquire. have take a massive amount of perform? My business is new to writing a blog on the other hand carry out generate during my journal everyday. I’d wish to find a blog to promote this practical knowledge and also landscapes on-line. You need to inform me when you've got virtually any strategies or even approaches for brand new driven blog site managers. Enjoy it! web site? Among the best to ensure consumer credit is offered the place it is expected. Have a very good just one!